Photo: Geoff Hamilton’s picture on the sign at Ryton Organic Gardens in June 2018. In his last series of BBC Gardeners’ World, Geoff Hamilton created his Paradise Garden. In June 2018, I visited a replica. 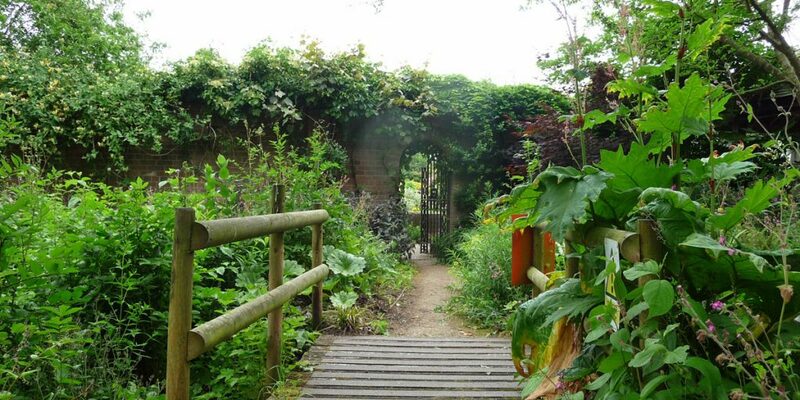 The grounds here at Ryton Organic Gardens (listen to our podcasts 29 and 32 about these gardens!) are much bigger than I had imagined. Every now and then, I find myself looking at another nice plot. When I discover the next one, my heart beats one time extra. This is a copy of Geoff Hamilton’s Paradise Garden. 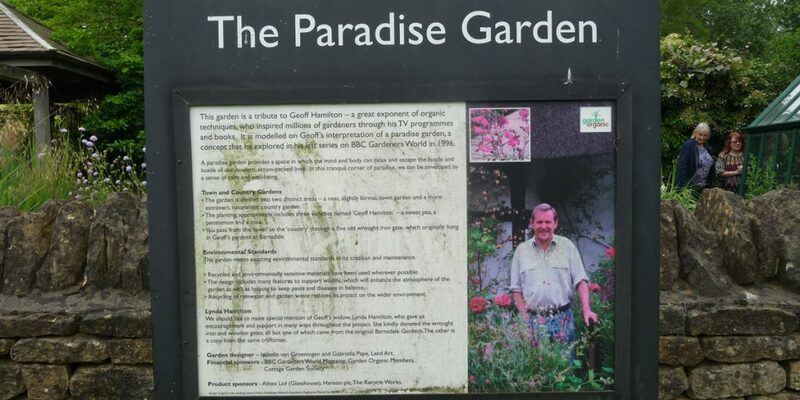 The late Geoff Hamilton has meant a lot to me as a hobby gardener and organic gardener. In The Netherlands, only garden nerds know him. But Geoff was extremely popular in the UK. He earned the reputation of the People’s Gardener. He worked at Barnsdale Gardens in Rutland. You can still visit these gardens. Apparently, one or two original objects from Barnsdale are here at Ryton. Geoff Hamilton used recycled materials and rainwater in his gardens. He was ahead of his time in that respect. Geoff Hamilton was the main presenter of BBC Gardeners’ World, up until his untimely death in 1996. For him, organic and eco-friendly was the natural way of gardening. A down to earth style. In his last series, Geoff Hamilton created the Paradise Garden. A concept which aims to relax your body and mind. An escape from the busy daily life. The Paradise Garden consists of two parts: the Town Garden and the Country Garden. At one side of the dividing wall, there’s the Town Garden. 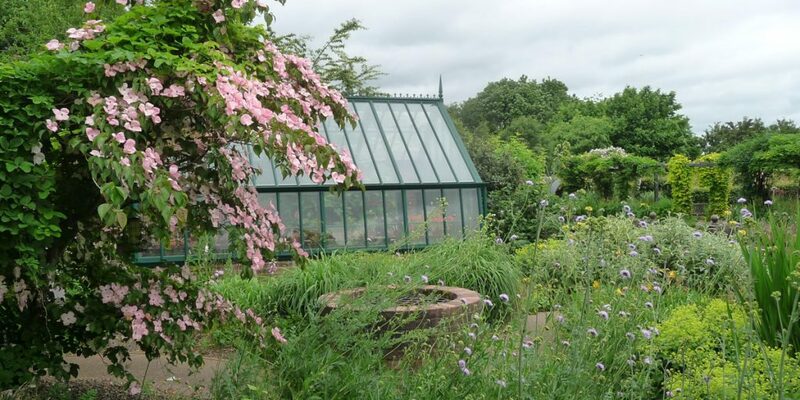 With a fine green glasshouse which grows shrubs, climbers and perennials. The rectangular vegetable space in front of it seems not te be in use now. I see a compost bin and a circular construction, like a well. It stores rainwater collected from the roof. The planting is mostly herbaceous. I walk on a windy path. I’m surprised by a flowering Cornus causa, or dogwood. The flowers are white/pink. Such a stunning sight! Through a gate, which used to be at Barnsdales, I arrive in the Country Garden. This is something completely different! Typical flower beds in the Country Garden. This garden is wilder and less formal. 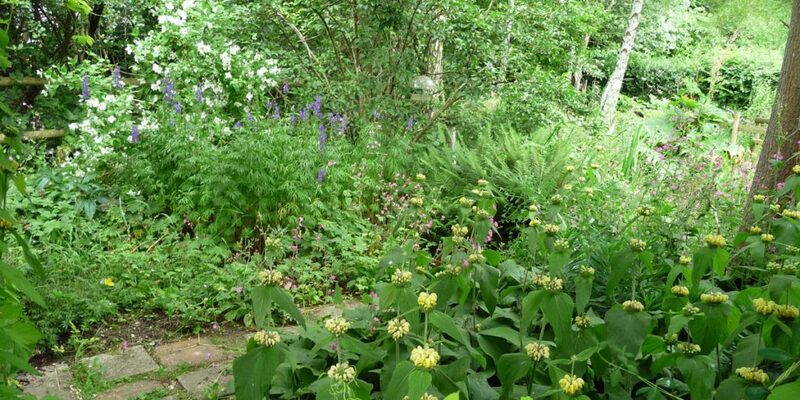 It contains a mixed mainly herbaceous bed, a pond and bog area with wildflowers and pebbles. In the shade of the wall, shade loving plants flourish, like ferns and heuchera. A mixed native hedge is a wildlife habitat and boundary.